It’s a great thing, of course, to have goals and aspirations. New Year’s Resolutions even. But there are many wrong ways to do this. Many ways which leave out God, some unintentionally. And in his mercy, God will frustrate your plans. Just like he did with the Tower of Babel. 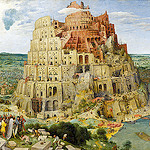 In Genesis 11, we see the story of the Tower of Babel – a story that has always intrigued me. After the flood, the descendants of Noah ignore God’s commandment to be fruitful and fill the earth. Instead, they attempt to build a massive tower for their own fame and security. God noted the power and ability of the unified people. Made in his image, much was possible for them. The problem was that they were working towards selfish and sinful aims. God confuses their speech, creating multiple languages. And the work stops. The project fails. Upon an initial reading, it sounds almost as if God is petty. The people are working hard on a project that unifies them. God, on the other hand, desires for them to fail. It’s as if he’s threatened by their productivity. But as we dig further, we see that God acted mercifully to the builders. Their ability was a danger to them. They couldn’t build something that truly lasted forever. They couldn’t build a structure to keep them truly safe. Their efforts would prove unsuccessful in the end. So God kept them from futility. But their productivity was enough to keep them distracted. Their strength was enough to give them a false sense of confidence. They would live their entire lives making bricks, building towers, and completing project upon project. Until they died and it didn’t matter anymore. And it was then that they would realize that they had lived their lives in search of selfish and sinful glory. They had relied on their own strength. They had forgotten about God. Such an ancient story may seem to have little to do with us, but I think the implications are staggering. How often do we start to make goals based solely on what would make us great? How often do we act out our strengths and forget where our abilities come from? How often do we allow initial success to make us less reliant on God? How often do we push through setbacks instead of seeking God’s perspective? How often do we consciously remind ourselves of our dependence on God? As we think about our goals and resolutions, remember who is the one who is working through us. Let’s rely on his power for his glory.